Download MIDI and MP3 backing track latest pop and rock chart hits. Each week, the Hit Trax team produce and release new backing tracks based on pop and digital download charts around the world. Download the top chart hits including free lyrics. 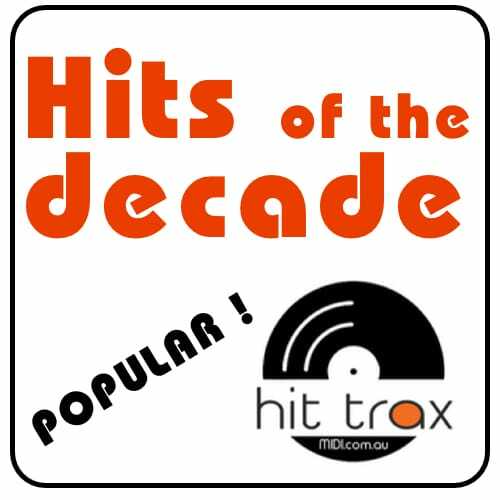 Hit Trax has the latest and greatest hits from the USA, UK, Canada, Europe, Asia and Australia. Most MIDI song files include embedded (scrolling) lyrics and melody guides (MIDI Karaoke). MP3 backing tracks include full mix, minus guitars and bass/drums mixes. Our producers look for chart activity and Top 40 predictions daily. Download top selling MIDI and MP3 backing tracks right here at Hit Trax.